Flavors, sweet and pungent, as diverse as India itself. The country’s cuisine differs greatly according to region. The North uses its spices whole while the South blends their spices in a paste with cooked onions and other ingredients. The North relies on wheat and other grains while the South depends on rice. A daily trip to an open air vegetable market assures that one is cooking with the freshest ingredients possible. Chilis and onions are always bought in large quantities. Spicy India lets you truly savor a taste of all that India has to offer. Arrive in Delhi where you will be met and driven to your hotel. Tour Delhi’s historical sites including the Red Fort, once the most opulent fort of the Mughal Empire and the Jama Masjid, India’s largest mosque. Explore ‘Chandni Chowk’, Kinari Bazaar, Dariba, Paranthe Wali Gali, observing the wide range of street foods available. Enjoy lunch at Chor Bizarre. Take a private helicopter excursion to Agra. This afternoon enjoy the unparalleled beauty of the Taj Mahal as you tour its gardens and the spectacular monument, built of marble and glistening in the setting sun. Return to Delhi in the evening. Early this morning walk through Delhi’s famed flower and spice market, teeming with locals as the sun rises over Delhi. Later this morning tour New Delhi, ‘Jewel in the Crown’, built by the British with its many buildings designed by Lutyens. See India Gate and pass by the Presidential Palace. Lunch at Color & Spice Restaurant where you will sample atypical thali meal. Visit Humayun’s Tomb and the Qutab Minar. This evening dine at one of Delhi’s‘in’ restaurants to experience Punjabi cuisine at its best. Fly to Varanasi, the holiest city on the Ganges River. Travel by rickshaw to the ‘ghats’ and tour this medieval city. Varanasi is a feast for one’s senses! It is a haven for vegetarian dishes of every kind! Visit Kachauri Ciali, a lane filled with a tempting bouquet of spices, where cooks sit beside huge pans of smoking oil, balanced on earthen ovens. This evening enjoy a vegetarian meal at a private home. Enjoy a sunrise cruise on the Ganges to witness pilgrims at their daily ablutions followed by a drive to Lucknow. Famed for its elegant language, refined culture, classical dance, and cuisine, Lucknow is a city intricately linked to the ‘beginning of the end’ of the British Raj. Enjoy Lucknow’s unique Avadhi cuisine, envied throughout the rest of India. Dinner this evening is at a local restaurant, tasting the kormas, kabab, rotis and parathas among other delicacies of the refined Lucknawi palate. Tour highlights of Lucknow, including the British Residency, the Imambaras and the Bhulbhulaiya, a labyrinth where one can easily get lost! Explore bustling Aminabad, a market famous for jewelry and its pickle shops! This evening enjoy a dinner of local specialities, a biryani, or perhaps a kabob at Faluknuma Restaurant. Today fly to the British Colonial city of Calcutta, now called Kolkata. The British Empire took hold and flourished in Kolkata, once referred to as the ‘City of Palaces’. When it comes to Kolkata cuisine, it can be said that each district of Bengal has its own unique dish to offer like Langcha and mihidanasitabhog of Bardhaman, sharbhaja of Krishnanagar, chanabora of Murshidabad, among others. Explore Kolkata, its famed architectural highlights such as Victoria Memorial and visit the Indian Museum, its collection started by the Asiatic Society established in Kolkata in 1874. Visit Kolkata’s Marble Palace where Victorian bric-a-brac stands next to masterpieces by Rubins, Reynolds, Murillo, and Titian. From here take a walk through College Street, a large open-air series of stall-like shops bordering College Street, near the oldest part of the colonial city. Magnificent architecture, Boi para (book-neighborhood in Bengali) is the world’s second largest market of second hand books from classics, textbooks, and manuscripts to comics. Kolkata was home to great writers such as Rabindranath Tagore and Subhas Chandra Bose.Enjoy dining this evening at a local restaurant to enjoy the Bengali cuisine. Visit New Market which has a charm of its own. It is probably the only place in Calcutta to get Bandel cheese, a smoked Indian cheese. Visit Nahoum’s Bakery, a Jewish-owned bakery and confectioner that tempts one to enter and indulge the senses with aroma and variety. Enjoy a Kathi roll (kebabs wrapped in dough). Stop by Nilhat House, home of one of Calcutta’s oldest businesses, where an enterprising Welshman in 1678 set up an auction house which today sells more tea than any other company in the world. Observe a tradition of ‘tea auctioning’ that has changed little since the 18th century. Fly South to Chennai, seaside capital of Tamil Nadu. A city of elegant colonial mansions sprinkled with gardens, palms and a broad esplanade along the shore, it is a city of contrasts. Chennai is noted for its delectable South Indian cuisine distinct from North Indian cuisine, equally famous. From the idli, vada, and idiyappam to uppuma and dosa, Chennai provides a delicious variety for the taste buds. This morning visit the Kalekshetra Dance Academy and observe students in their daily classes of classical dance and music. Your tour continues with a visit to Mahaballipuram, the great temple city of the Pallava Dynasty. Here the profusion of temples spill onto the beaches and you can still see stonecutters producing classical sculptures. Today a culinary cooking experience with a private cooking class, ending with a typical ‘chettinad meal’. Today fly from Madras to Cochin, a port city of Kerala. Transfer to the famed ‘backwaters’ region where you will relax and enjoy your luxury resort. Today sail through the backwaters and visit a typical ‘island’ farm to learn the unique agricultural farming techniques employed in this unusual setting. You will have lunch with the family who farm it. Disembark and return to Kochi. This afternoon visit the Portuguese church of St. Francis, a Synagogue built in 1568 and the Mattancheri Palace, built by the Portuguese and renovated by the Dutch. Today is another day of cuisine immersion, First enjoy a visit to a local vegetable and fish market then continue on to the private home of Mrs Nimmy Paul a renowned Keralan Chef. 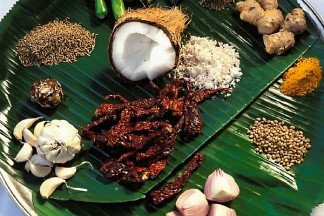 Enjoy a traditional “Sadhya” served on a banana leaf, an extensive meal usually served at weddings and other festivals. Nimmy will explain the traditions and history behind the dishes. During the afternoon Nimmy will lead a cooking demonstration in which you can participate in preparation of your evening dinner.